Bob Anderson, the man who you didn't know was once Darth Vader, has died as of yesterday. Sure, you'd probably think of either James Earl Jones or David Prowse when you think of Darth Vader, but Bob was there when they needed him most: when Vader wielded his lightsaber. 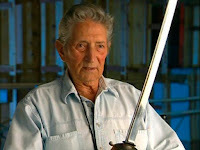 The force was strong with him for 89 years, as he worked with numerous stars and on major films supplying stunt swordsmanship and teaching actors and actresses how to handle their long bladed weapons. This is not a man you would want to start a sword-fight with in the bathroom. He would totally win. He leaves behind a long legacy of film sword work, dating back to even scenes with the great Errol Flynn. Yeah, he worked on the Antonio Banderas Zorro films too, but you don't care about that. You lost a dark lord of the Sith, and for that we say rest in peace, Bob. If only they could have saved you and turned you into a dark and mystic cyborg.